Robotics, Artificial Intelligence (AI) and Automation | Littler Mendelson P.C. The use of robotics, AI, and automation in the workplace is no longer relegated to science fiction. Spending on robotics and AI will reach $250 billion during 2020, exceed a trillion dollars during 2025, and sometime thereafter, robotics and AI will become the largest industry in the world. It is projected that by as early as 2025, half of the jobs in the U.S. could be performed by self-learning machines and software. According to Littler, recent advances in the technologies of AI and robotics have led to a sharp increase in the capabilities and cost-effectiveness of automated systems. As employers incorporate robotic technology into the workplace, they must also adapt their compliance systems to this unique and rapidly evolving industry. Employers in the robotics industry should prepare for the legislative and regulatory obstacles that could affect how they do business in the U.S. and abroad. Attorneys in Littler’s Robotics, Artificial Intelligence (AI) and Automation practice group regularly assist employers in the technology sector and employers that are integrating technological advances into their workplaces to navigate the complex and evolving terrain of employment and labor law. 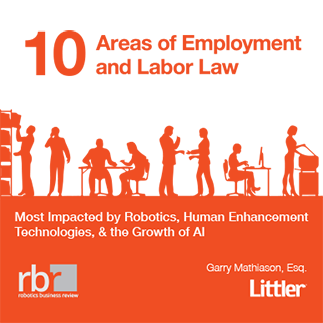 As the world’s largest law firm focusing solely on legal and regulatory issues affecting employers, Littler is positioned to help businesses confront the new challenges that robotics brings. Our Robotics practice group also works closely with Littler’s Workplace Policy Institute™ to provide expert testimony and model policies on issues of greatest import to this industry. The rise of artificial intelligence (AI) and robotics will generate unprecedented opportunities and challenges for employers and workers. Learn how Littler can help you prepare. Examine how your products or software could be used to help users attain workplace compliance. For example, robotic exoskeletons or voice-activated software might be an appropriate reasonable accommodation for an individual with disabilities. The above is just a sampling of our experience representing robotics entities in employment and labor law matters. To learn more about the Robotics practice group, our specific experience, and how we can help you, please contact your Littler Attorney. Work gives our lives meaning. What will we do when robots have taken our jobs?